The calorie density (or energy density) of a food is a measurement of the average calories per weight (gram or ounce) of that food. 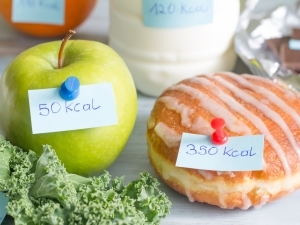 If you're looking for guidance on what types of foods you should consume each day in order to reach, but not go over, your Calorie Target it's worthwhile considering a food's calorie density. By choosing foods that have a low calorie density you can eat more food and feel full on less calories. This can be especially useful if you have a Calorie Target of 1200 calories or if you don't exercise much. Foods that are low in calorie density tend to be high in water and low in fat. Examples include fruit, vegetables, low-fat dairy, clear soups and lean meat. So for 50 calories you could eat a cup of strawberries (low calorie density) or one donut hole (high calorie density). It's easy to see that a cup of strawberries would be more filling, have less fat, and more vitamins and minerals than one donut hole. If you want to make your calories go further, before eating a food look it up in the Food Database and find out its calorie density. On the page that lists the nutrition information for the food, you will see the food's calorie density rating. The more stars a food has, the better the food is in terms of calorie density. So strawberries have a calorie density rating of four stars, indicating they are low in calorie density. Note that some foods in the Food Database do not have calorie density stars. For these foods the calorie density is unknown. It does NOT mean that they are low (or high) in calorie density. You’ll find this is often the case for drinks. Note: Calorie density (more calories per weight) is not the same as nutrient density (more nutrients per calories by weight). You want to aim for lower calorie density, but higher nutrient density.